In May the Pakistani military started a full scale military offensive in the Swat valley against militants of the so-called Pakistani Taliban. Swat is part the mountainous north/west of the country in the administrative region called Malakand. It is a notoriously difficult region to control with few roads and enormous mountains and is well suited for guerrilla warfare. It is a region which the British Raj failed to control directly and allowed to exist as a number independent states during the time of British rule, and which only became part of Pakistan in the 1960s. Despite the fact that the army is fighting guerrillas, this offensive appears to be a conventional military campaign with full scale use of air and ground forces in which the whole area is being treated as enemy territory and civilians are left to fend for themselves. The army has moved up the valley along the road and, according to its own spokesmen, killed many hundreds of Taliban militants as they recapture the main cities. It is, however, more likely the Taliban have melted into the mountains and will return to ambush army supplies and continue the campaign in the way they did previously. The savagery of the offensive has partially destroyed the cities, killed hundreds of civilians, and by early June had caused 1.5 million to flee from their homes. These people are now living in makeshift refugee camps. The region has, in effect, been plunged into a state of civil war. In February, only two months before this offensive started, the central government had signed an agreement with the local Taliban, with whom it had been fighting ineffectively for months. The agreement committed the government to withdraw the army from Swat and allow the Taliban to impose of Islamic, or Sharia law throughout Swat. At the time this agreement was hailed as a great success and a template for future agreements to end fighting in other parts of Pakistan. What has produced this rapid reversal of strategy? The Swat agreement had not, of course, been approved by the Pakistani state’s paymasters in the US who were absolutely outraged by it and demanded its immediate reversal. Secretary of state Clinton described it as an “abdication to the Taliban.” The Pakistani Prime Minister, Zadari, was summoned to Washington and after what was described as “an extremely productive” meeting the agreement was torn up and the present offensive launched. The US has therefore pushed its Pakistani client into this war. The Pakistani army, however, is not trained for guerrilla war, and a key US military strategist in Afghanistan, Colonel David Kilcullen, has described the outlook as “pretty bleak”. He said he doubted the offensive would succeed. Kilcullen added that, if the offensive failed, the NATO supply route through Pakistan, which carries almost all the supplies to the forces in Afghanistan, could be threatened. We could be “creating a Stalingrad in the Hindu Kush”, he concluded. The Pakistani army, he said, was “refusing US assistance and training.” His remarks indicate both that the US had offered these things and that it is a US ambition of become directly involved in the war in Pakistan. They also indicate how the US now regards the wars in Afghanistan and Pakistan as one war, the so-called Af-Pak war, and to win the war US operations must be extended into Pakistan. Of course, the war has already been extended to Pakistan with the use of drones to bomb inside Pakistan and the use of the Pakistani army to do the US bidding in the Federal Administered Tribal areas. It is precisely the extension of the war which has led to the present conflict in Swat. The Obama team is simply stating openly that this extension is their policy and that it must be pursued with more energy. As soon as Obama became President he set up a review of US policy in Afghanistan and Pakistan and a so-called “new” strategy was announced at the end of March. This appears to be modelled on the Iraq surge in troop numbers carried out by the Bush administration. The existing commander in Afghanistan has been replaced by the man who previously commanded special operations in Iraq, McChrystal, and troop numbers are to be increased from the present 32000 to 68000. Attempts are to be made to open negotiations with the moderate elements in the Afghani Taliban. This is a repeat of the successful alliance the US struck up in Iraq with the Sunni militia, in which the so-called winning their hearts and minds was achieved by putting them on the US payroll. Despite the moral tones assumed by Obama, which he underlined in his Cairo speech to the Muslim world (see statement following this article), the policy of massive military response and terrorising the civilian population is not going to be ended. In May, for example, (2) months after the Af-Pak policy way launched the US air force killed 245 women and children in Farah province because Taliban had attached government troops in a nearby village. Such attacks amount to terrorising the civilian population, on the lines the Israelis used in Gaza, in the hope that they will turn against the Taliban. However, the Obama team think they can still “win hearts and minds” by ploughing money into civil and infrastructure projects in both countries. For Pakistan this means that, in addition to the $1bn given to the military annually, it is to be given $7.5bn for civil projects over 5 years. All the new aid is supposed to be “benchmarked” which means that the billions of dollars will stop arriving if the benchmarks are not met. Obama’s strategy is to try and get some of these vast sums to the Pakistani people rather than to the military and state officials. Judging by past performance this is very unlikely to occur. The vast sums given by the Bush administration have been largely wasted as far as the US is concerned. Between the invasion of Afghanistan in 2001 and the end of 2008 Pakistan was given some $11bn! 60% of this went through the Pentagon to Pakistani army so could not be audited by US Congress. Apparently it was spent it on weapons to fight India rather than fighting the Taliban, and some of it might even have been channelled to the Taliban. The rest, some $4.4bn, was channelled through the government. Some was used for servicing the country’s debt and some simply disappeared along the way. Certainly ordinary Pakistanis saw none of it. The aim of the war is the same as it was under Bush, namely to produce stable US protectorates in Afghanistan and Pakistan as means to gaining access to the energy wealth of the Caspian Basin, and to exclude Russia and China from the area. Despite all the fanfare we have heard accompanying the launch of the “new” Af-Pak policy there is no difference between the aims of the “new” policy and the “old”. Obama is essentially pursuing the same aims as Bush but with a more vigorous strategy. When Obama’s envoy to Afghanistan and Pakistan, Richard Holbrooke, visited the countries in February it was reported that he was appalled by what he saw. After 7.5 years of so-called “freedom and democracy” the Karzai regime appears to be collapsing by a process of attrition and corruption. Karzai, who was considered a reliable appointee by the US, since he previously was on the payroll of the CIA, controls little more of the country than the capital city, Kabul, while large areas of the country are in the hands of the Taliban. Corruption in government is rife with most aid money being siphoned off before it can be used for any projects. Also, as Holbrooke noted, officials in the Karzai government are enriching themselves with income from the opium crop and it is they, rather than the Taliban who benefit most from the drug trade. The main source of funding for the Taliban comes not from drugs but from donors in Saudi Arabia and the Gulf countries. (3) Karzai has also shown insensitivity to US attempts to clean up his human rights image by allying himself with a notorious Tajik warlord, Fahim, who is to be his running mate in the August election. On the other side of the border, Pakistan is in acute economic crisis and a state of incipient civil war. Pakistan could collapse into a failed state, despite all the aid the US has poured into the country. The situation has deteriorated sharply since the key US ally, military ruler Musharraf, was forced from power. There is now a weak civilian government and a military, which is not only suspicious of the government and reluctant to carry out its orders, but which is internally divided between supporting the Taliban and fighting it. The present fiasco in Swat illustrates both these issues. The government is massively unpopular and distrusted among the masses. The economic crisis and the war are key issues in this. Inflation is now 100% (3), between 6 and 7 million workers are unemployed and public services are notoriously unreliable. Electricity generation, for example, is insufficient for the country’s needs and is only available 12 hours per day in many regions. When disasters like the 2005 earthquake strike the state is unable to handle the situation. Today over 1 million people made homeless by this earthquake are still living in temporary camps. The state’s finances are in a precarious condition and interest payments on the national debt of $45bn represent a continual problem. At the end of 2008 the Pakistani authorities were again (4) unable to meet state commitments. They approached Saudi Arabia and asked it to defer a $6bn payment for oil imports, and approached both China and the IMF and asked for immediate loans. China was asked to provide $1.5bn and the IMF $4.5bn. In November the IMF agreed to provide an international standby loan of $7.6bn to get the country out of its short-term crisis. Since then the US has come up with a new package of loans as mentioned above; $7.5bn for civil projects over 5 years and $1bn annually for the military. Pakistan’s position as a strategic ally of the US ensures that finance keeps arriving since the collapse of the country would be a disaster for US war aims. However, Pakistan has its own aims and it is also an ally of China. The Pakistani ruling class has its own interests in Afghanistan but it is divided about the strategy of achieving these interests. It wants a regime in Kabul which will allow Afghanistan to be a corridor giving it access to the oil and gas of the Caspian Basin, and, at the same time, a regime which will exclude Indian influence from the country. It has always wanted a regime in Kabul which it could control and, of course, the Taliban was precisely such a regime, yet they have sacrificed the Taliban for the sake of their US ally. What they see is the US patronising their main enemy, India, providing it with nuclear technology and promoting it to principal regional ally. They see increased Indian influence in Afghanistan, including training of the new Afghan army, which will block Pakistani access to the Caspian energy while the flames of war are being spread into the Pushtun regions of Pakistan by the US. The Pakistani army, in its attempts to contain the militants, has suffered more than three times the number of casualties suffered by NATO (5). It is not surprising the Pakistani ruling class is ambiguous in its support for its US ally. While the faction holding immediate political power see the alliance with the US as a route to aid, grants, IMF loans and thus to economic growth, sections of the military, notably the Inter Services Intelligence or ISI, feel they have been double-crossed by the US. While, in the regional context, the US was their principal ally against India, they now see the US turning the tables and India becoming the principal ally with Pakistan demoted to an auxiliary, an auxiliary which could be sacrificed if necessary. This leads them to look again to their Chinese ally. In regard to Afghanistan they remember how it was the ISI which helped the US build up, train and arm the Mujahideen (6) when they were being used for fighting the Russians and now that US interests have changed they are being asked to disarm and kill them. They see the US as pushing them into a war they cannot win and which will lead to disaster. They see Pakistani interests as being best served by supporting the Taliban to produce a government in Kabul which they can influence. This faction tends to look beyond the US military presence, to protecting Pakistani interests after a US withdrawal. However, a US withdrawal, even in the medium term future is highly unlikely. We only have to remind ourselves of the reasons for which the US invaded to understand this. As we have written many times in the pages of Revolutionary Perspectives (7), the struggle for control of energy resources has today become the primary focus of imperialist conflict and we maintain that this was, and remains, the central issue in the Afghan war. Gas and oil are the real stakes for which the “Great Game” in Central Asia is being played. The war in Afghanistan has absolutely nothing to do with bourgeois democracy, freedom, rights of women or any of the other absurd explanations the capitalist media serves up for our consumption. The aim of the US is to control the oil and gas of the Caspian Basin and to construct pipelines which bypass Russia and Iran thereby isolating them, together with China, from this energy. The invasion of Afghanistan was planned long before the attack on the twin towers, all this attack did was provide a convenient pretext and so speeded up its implementation. The grand design of the US is to create a mosaic of client states along the southern Russian border and the western Chinese border thereby controlling how much energy they receive. Long before the Afghan war the US oil company Unocal planned a pipeline to get Turkmenistan’s gas to the Indian Ocean via Afghanistan and Pakistan. This was the so-called TAP pipeline. Soon after the Taliban took power in 1996 they were invited to Texas and offered a cut of the profits if they cooperated in building the pipeline. The negotiations broke down largely because the cut of the profits was too small. Also the Taliban failed to subdue the whole country and create the peace required for constructing the pipeline. The Taliban were again invited to Washington in 2001 to be given a new offer but again negotiations broke down over transit fees (8). After the US removed the Taliban later that year one of the first acts of the new Afghan regime, whose leader, Karzai, was previously a Unocal representative, was to sign a deal with Turkmenistan and Pakistan to build the TAP pipeline. The failure of the US to pacify the country has, however, again frustrated the construction of the pipeline. 7 years later, in 2008, a further agreement to built the TAP pipeline, but this time with an extension to India, the so called TAPI pipeline was agreed with construction due to start in 2010. This pipeline is to run through areas now controlled by the Taliban, such as Helmand province, hence the new troop surge to make the Afghan corridor a safe route for the export of energy. On the other side of the “Great Game”, Russia has been working to keep the oil and gas of the Caspian flowing north through its pipelines (9). In 2006 Russia’s Gazprom bought Turkmenistan’s entire gas surplus in a deal which apparently gave the Turkmen state 40% above the current price. Turkmen gas continued to flow north through Russian pipelines. In this deal the Russians also bought exploration rights and thought they had the entire Turkmen gas supply cornered and had thereby cut the US out. Turkmenistan has the world’s largest reserves of gas and despite agreeing to supply Russia, China and Iran with 50, 40 and 8bn m3 per year respectively its supplies are not exhausted. (10) It has later transpired that although Gazprom thought it had bought the entire surplus of gas and all the exploration rights this was not the case and the quotas agreed to Russia and China can be reversed. Thus the US strategy is still alive and the TAPI pipeline scheme was revived. China and Russia have also formed the Shanghai Cooperation Organisation (SCO) as a counter to US penetration of central Asia and to prevent their isolation from the Caspian energy sources. The SCO consists of 4 central Asian countries, Kazakhstan, Uzbekistan, Tajikistan and Kyrgyzstan, together with Russia and China. Pakistan, Iran and India are observer members. The organisation is a military and economic alliance. On the military level its members conduct joint military exercises which led to the first ever military exercises between Russia and China in 2005. On the economic level it is supposed to foster economic cooperation including the exploration for and transfer of hydrocarbons. The first result of the military cooperation has been the ejection of the US from their base in Uzbekistan in 2005. The loss of this base makes the Afghan campaign more difficult. On the economic side a 3000 kilometre pipeline to transfer Kazakh oil to China has been under construction since 2003 and another 7000 km pipeline to transfer gas from Turkmenistan, via Kazakhstan, to China was agreed in 2007. Other pipelines are being planned. The US is, of course, also trying to get the energy of the Caspian out along a corridor to the west. The completion of the Baku-Tbilisi-Ceyhan or BTC pipeline by BP-Amoco in 2006 was considered a triumph. However the Russian invasion of Georgia in 2008, which brought Russian troops within 50 km of the pipeline, has made the whole project look less secure and made the route through the Afghan corridor more urgent. To have any hope of achieving it’s aim the US must keep a military presence in Afghanistan and consequently US military bases. Despite Obama’s pretty speeches denying that the US wants military bases in Afghanistan or Iraq the US will only withdraw if it has succeeded in producing a stable protectorate with military forces capable of executing the US bidding. This is not a prospect on the horizon. China, which is now the world’s second largest economy (11), is also the second largest consumer of oil. In 2008 it used approximately 1million tonnes of oil every day (12) which amounts to about 37% of US consumption. 60% of its oil imports come from the Middle East with most of the remainder coming from Africa. Much to the annoyance of the US, China has built up trading relationships with certain states which the US brands as “pariah states” such as Iran and Sudan. In both these countries Chinese oil companies have displaced US companies and the Chinese have ignored US sanctions and provided cover for the regimes in the UN. Chinese oil companies, backed by the Chinese state are in competition with the US for sources of oil, routes for pipelines and for transport. China has become a player in the “Great Game” in its own right. However, despite China’s attempts to transport its oil directly into the country through pipelines, 95% of this oil is still transported by sea. China fears that in the event of a future conflict with the US, the US navy will cut its oil imports at one of the many choke points on the route from the Middle East to China. To try and counter this threat China is developing harbours in neutral countries along the sea route, from which its navy can operate to protect its shipping, and trying to bypass the choke points by construction of new pipelines. The Pentagon has christened this strategy the “string of pearls.” Ports are under construction at Gwadar in Pakistan, Hambantota (13) in Sri Lanka, Chittagong in Bangladesh, Sitwe in Burma and on a number of islands in the South China Sea. There is also talk of building a canal across peninsula Malaysia at the Kia isthmus to avoid the Straits of Malacca. The development of the Pakistani fishing village of Gwadar into a deep sea port with facilities for the Chinese navy is the first major port of the “string of pearls” strategy and is a direct challenge to US ambitions in Afghanistan. Gwadar can become a destination for pipelines from Iran, Turkmenistan or other countries in the Persian Gulf (See map opposite). Pipelines from Iran or from the Gulf states to Gwadar would bypass the gulf of Hormuz, one of the first choke points on the shipping route from the Persian Gulf to China. A pipeline from Turkmenistan to Gwadar would make the Turkmenistan Afghanistan Pakistan (TAP) pipeline unnecessary and give the Iranians and Chinese control of the route. A pipeline from Iran to Pakistan to India, the IPI pipeline, would undermine US attempts to isolate Iran. China, of course, already concluded a mega deal with Iran in 2004 to buy 250 million tons of liquefied gas over the next 30 years, and 150 000 barrels of crude oil per day for the next 25 years. Pipelines bringing this gas and oil to Gwadar would suit both China and Pakistan. China is also considering an oil refinery at Gwadar and a pipeline through Pakistan from Gwadar to Xinjiang province thus entirely cutting out the sea route. These developments would, however, be a major setback for the US. Pakistan has been an ally of China since the China/India war of 1962 and the Pakistani ruling class are happy to play China and the US off against each other. Pakistan receives loans, development work and massive amounts of arms from China. 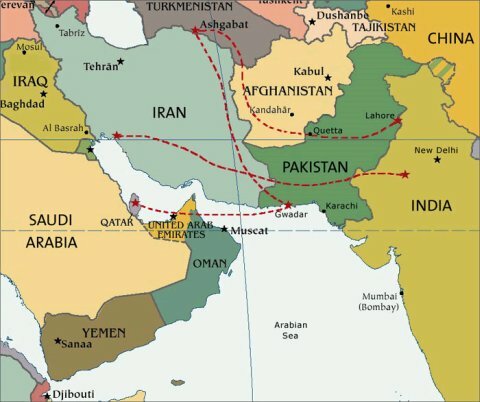 (14) If China were to develop an oil corridor through Pakistan, using routes through Iran, it could suit the Pakistani ruling class better than the US plans to bring oil through Afghanistan. China has 120 projects under construction in Pakistan with over 10 000 engineers and experts in the country (15). The development of the port of Gwadar is the largest Chinese project but one of many. Others include nuclear power, roads and railways. One nuclear power station has already been built and a further 2 have been agreed, (16) a highway linking Gwadar to Karachi is under construction and a rail link from China to Peshawar is being planned. The economic conflicts of interests outlined above are setting the stage for future wars. There is already a war raging in Afghanistan which is being extended into Pakistan and the new US administration has committed itself to wage it with more vigour. If the US becomes directly involved in Pakistan this will be a serious challenge to China and, one way or another, the US will find itself opposed by Chinese imperialism, and possibly by other members of the Shanghai Cooperation Organisation. US direct intervention is, therefore, an extremely risky strategy but one which may become necessary to avoid what Colonel Kilcullen predicts as the “Stalingrad in the Hindu Kush”. It is clear the situation in Central Asia contains the seeds of future wars. Of course, these forces have been used, and are still being used, by Pakistan in its struggle against India and in pursuing its interests in Afghanistan. The phenomena we are witnessing can be simply explained by the drive to secure energy and the need to protect its sources and transport routes. What lies behind this, however, is the need for capitalism to continue to expand. Capitalism must grow and capital must accumulate. Above all capital must generate profits in an ever-expanding quantity. This need which is fundamental to the capitalist system is the root from which the entire structure of capitalist imperialism springs. This means that as long as capitalism is the global system of production imperialism will be the key force which leads the world from one war to the next. As death and destruction sweep country after country the dreadful consequences of the capitalist system are exposed. The imperialist powers, their local agents and their opponents, the so-called “terrorists” are all equally reactionary. The only social force which could create a way out of the inferno, into which Central Asia is descending, is the international working class. However, at present the working class is passive in the face of these wars and, if anything, sees its interests with the local nationalist leaders. This is a great mistake. Only by raising the banner of class against class can this cycle of imperialist war be broken. The struggle for peace consists of the struggle by the working class of the region for its own interests against those of the nation. This is a necessary step in the international struggle to overthrow the capitalist system and replace it with a communist (17) system of production where energy would be distributed globally according to need. (1) See report Financial Times 13/05/2009. (2) See Financial Times 26/03/2009. (3) See The Guardian 24/10/2009. (4) The US saved the Pakistani state from default on its debt in 2001 and again in 2003. (5) Before the Swat offensive the army had lost 2225 soldiers. See en.wikipedia.org . (7) See, for example, Revolutionary Perspectives 49 “Gas Wars” as well as Revolutionary Perspectives 44 “Squaring the Circle - the Contradictions of US Imperialism in Iran, Turkey and Pakistan”. (9) For a discussion of the Russian pipeline strategy see RP 23 Imperialism, oil and US national Interests. (10) Turkmenbashi previous leader of Turkmenistan boasted the country could export 150 bn m3/yr for 250 years. Quoted veteranstoday.com . (12) US consumption in 2008 was 19.4 million barrels per day or 2.7 tonnes per day. (13) Since the Chinese began work on Hambantota China has become the Sri Lankan government’s major arms supplier and it is these arms which have enabled the government to defeat the Tamil Tigers. Hambantota is destined to also provide naval facilities for the Chinese navy. (14) Between 2003 and 2007 Pakistan took 36% of all Chinese arms exports. (15) See Pak Alert Press . (16) See Wall Street Journal . (17) By Communism we mean the production for need in which the means of production are common property. This has nothing to do with the system of state capitalism which existed in Russia, China, Cuba or anywhere else.